Last night was one of those nights — we didn’t bring a book with us, but Vasa Saga: The Story of a Ship by Bertil Almqvist definitely caught my eye. We all agreed we wanted to take it home. Vasa was a glorious ship built in Sweden in the early 17th century. It was the pride and joy of Sweden’s king Gustavus II Aldolphus. The Vasa Saga beautifully illustrates how the ship was built — from the search for wood for the ship and its ornaments, to creating the curved pieces of the ships body uses the technology available at the time. Unfortunately, the Vasa was a flawed ship and she sank on her maiden voyage out of the harbor. Much of the book takes place while Vasa is under the water. She watches on while divers cleverly salvage many of her canons. Then she sits lonely and forgotten for centuries under the sea near Stockholm. Her fortunes change in the 1950s when she is once again discovered — and now technology has improved to the point where she can be rescued from the water! We all really enjoyed reading this story–though Mr. K had waaaay to many questions for us while we tried to read it the first time through! Miss M grabbed the book this morning for another read without interruptions. 🙂 Of course the kids wanted to know if it was a true story (it is — except for the personification of the ship, of course!). They also wanted to know if we could go see the ship someday (yes, if we ever make it to Sweden, it is still on display as a museum so we could go see it). We are thrilled to have found this treasure in our Little Free Library! 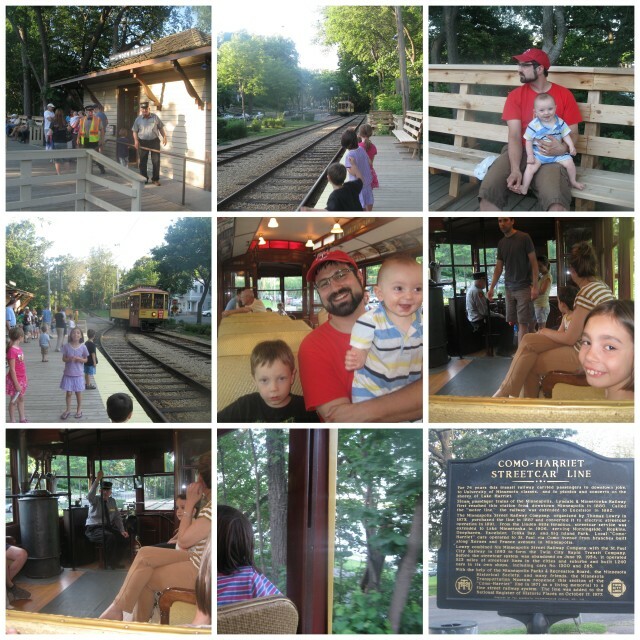 I have been eagerly anticipating our outing to ride the Como-Harriet Streetcar for months. I’ve wanted to do this for years, really, but I kept forgetting about it during the right time of year. Back in January I read the book, “Twin Cities by Trolley: The Streetcar Era in Minneapolis and St. Paul.” I loved reading about this bygone era in transportation in our city, and firmly planted in my mind the desire to go ride this historic streetcar. I’m fascinated by this form of transportation that once criss-crossed our city and was completely torn out in the 1950s. Buses were all the rage then and much less expensive to operate and maintain. Now fast-forward fifty years and a different type of passenger rail service is making a comeback — a second “light rail” line is being installed in the Twin Cities to join the already-popular Hiawatha Line that made it’s debut several years ago. I can’t help but wonder how transportation in our city might have looked different today if the streetcars had been improved instead of torn out…wishful thinking, I’m sure! Visit Blogging through the Alphabet @ Ben and Me to see what other bloggers are writing about for the S (link coming on Thursday). 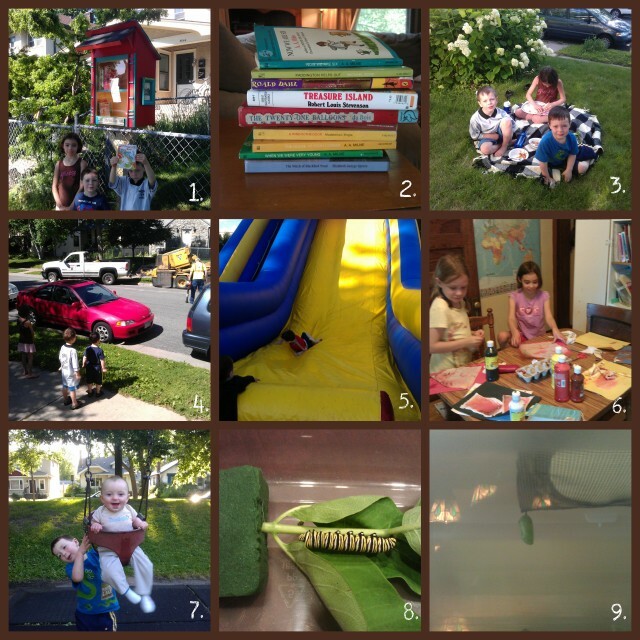 I’ve liked several of the “10 in 10” blog hop topics organized by the iHomeschoolNetwork and linked up to Top Ten Tuesday @ Many Little Blessings for other topics, but I haven’t been organized enough to participate in any of the “10 in 10” topics yet! I was clued in to this week’s topic early enough today to get a post written, so I thought I would join in the fun! 1. Why do you homeschool your kids? We did not make our decision primarily for academic reasons, though I do really appreciate all the wonderful academic opportunities we have with homeschooling to give our kids an excellent, personalized education. We chose homeschooling because of the unique opportunity it gives us to help our children develop Godly, Christ-like character and to be the primary influences in their lives during some very formative years of their lives. 3. Is it hard to homeschool with a baby and a toddler and a couple of older kids as well? Yes, some days it is very challenging! Other days, it doesn’t seem so bad as the boys play together and holding/feeding a baby is pretty conducive to doing school simultaneously. Planning ahead helps. I wrote a post a couple months ago with a few more thoughts about homeschooling with a new baby in the family. 4. Is homeschooling expensive? It doesn’t have to be! I feel like I am a “moderate” spender when it comes to homeschooling expenses. So far, we have typically spent a few hundred dollars per year on curriculum and activities. I try to find bargains whenever I can (often by buying used), but I am also not afraid to make good investments and to value my time by not creating everything myself. Some families spend a lot more than we do. Other families make do with spending much less, and all still give their kids a good education. 5. Do you have to be super organized and creative and love planning to homeschool? Okay, so no one ever asked me that question exactly. But people do say to me on a regular basis things like, “I could never homeschool because I am not [insert description here] like you”….where the “blank” in that sentence is often “organized”, “creative” or “a planner.” The answer is definitely, “No” — you don’t have to be “like me” in those ways to homeschool. It’s true that homeschooling isn’t for everyone. BUT, I make certain choices in my homeschooling because of my personality and strengths. There are many homeschooling methods and curricula that are very conducive to homeschooling for people with strengths, weaknesses and personality types very different than mine. 6. How do you find time to cook, clean, shop and do everything else you need to do AND homeschool? I don’t clean my house very often. Seriously. It is hard to find time for everything, and I am not always the best at balancing other household demands along with homeschooling (or along with parenting in general). I could improve at this and need to get my kids more involved, particularly with cleaning and dishes. On the other hand, kids are only little once and I am more concerned with raising Godly kids than having a spotless house. 7. Do you have a lot of rules and regulations you have to follow? Do your kids have to take standardized tests? Every state has different laws for homeschooling, but in our state (Minnesota), is fairly moderate as far as regulations go. For each student (age 7 or older by October 1st), we file an annual form with our school district and agree to take a nationally-normed standardized test of our choice each year. We also agree by law to provide instruction in basic subject areas such as math, communication, science, social studies and health/P.E. That’s it! The state does not tell us what books or curriculum to use or exactly what to teach. We don’t have to keep track of hours or days of schooling or report what we do. I’m thankful for the freedoms we have! 8. Do you have to stay home all the time if you homeschool? Well…No…and Yes! There are so many opportunities in our area for homeschoolers: co-ops, classes, lessons, sports, performances, group field trips, individual field trips… You could easily spend all day, every day engaged in some sort of activity. But if you spend too much time doing all those great activities, it will be pretty hard to get those “3 R’s” done, not to mention history, science and all the other subjects. I find I need to guard our time carefully. We participate in a co-op twice a month. During our school year we go on a couple field trips per month and the kids may be enrolled in one (or possibly two) extra curricular classes, sports or other activities at a time. We have to say “no” to a lot of interesting, fun worthwhile activities, playdates and so on in order to have enough time at home to get our homeschooling accomplished! Remember those homeschooling families I mentioned in question #2? A lot of them sent their kids to public school for high school. Not because they didn’t think they could do a good job of education in the higher grades or they didn’t want their kids to miss out on prom. Instead, it was because by the time their kids were high school aged, their kids were ready to be more of a positive influence in their school than the school environment would be a negative influence on them. They were ready to be a shining light in a public school environment and share Christ with their friends. We would love to have our kids in a school environment in high school to work alongside them to show Christ’s love to their friends. We see it as a stepping stone to them being even more independent in college — perhaps doing what we did and living in the dorms and sharing Christ with friends on their dorm floor. Do you have any burning questions about homeschooling? 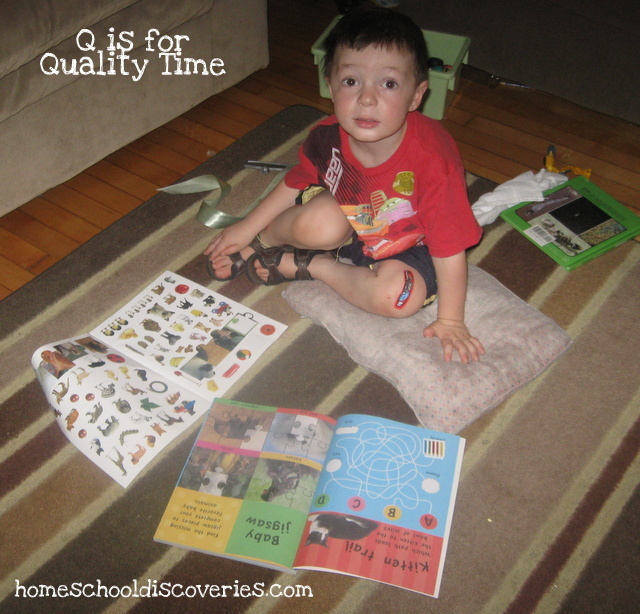 Are there any great questions that people often ask you if you do homeschool? Visit this week’s Top Ten Tuesday @ Many Little Blessings to read more Top Ten Lists about this topic and more! When a monarch emerges from its chrysalis (almost always in the morning), it needs to rest and inflate/dry its wings for a few hours. Our monarch emerged on Sunday morning before we left for church. Miss M and I had a bridal shower to attend after church so Tony and the boys released the butterfly while we were gone. (I did just learn, though, from reading this page on rearing monarchs that they could have waited until we returned home in the afternoon, and the butterfly would have been fine. Now we know for future years!). 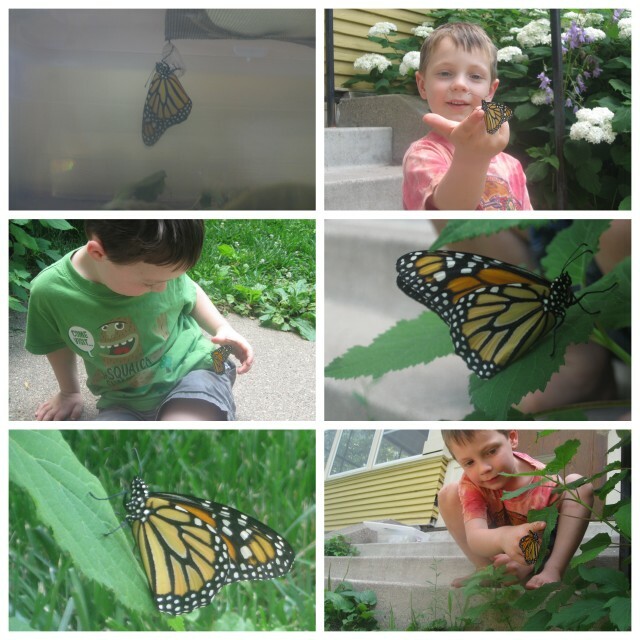 I love the process of raising monarchs. The tiny caterpillars grow so quickly and the change of metamorphosis is wonderful to see and such a great learning opportunity! Monarchs are a declining species due to loss of habitat, and it feels good to be involved in helping a monarch or two survive to adulthood each year. This year we’re also going to plant some milkweed of our own instead of relying on the milkweed of neighbors! We’ll create a bit more habit for them and have an easier time getting food for our little guys next year. We’ve had no shortage of things to keep up busy the past couple weeks! Last week, we spent three very full days doing service projects with Mission to the City. This week, we accepted an invite from a friend to do Vacation Bible Camp at a neighborhood church, so I had quality time with Mr. K each morning while the two older kids participated in the camp. Last week Mr. E started a once-a-week-for-six-weeks evening soccer class. And this week Miss M started a month of tennis at our neighborhood park. That’s every day (weather permitting), but luckily it is first thing in the morning (8am!) and she can walk to the park with her best friend from across the street (thank heavens for the S. family, so I don’t have to get everyone out the door before 8!). And on top of all of this, I’m nearing my quarterly editing deadline (July 1st) for Faithwalkers Journal, so I’ve been taking advantage of summer break and arranged several hours of daytime babysitting for the kids so that I could actually get my work done while I’m fresh (aka not editing late into the night while the kids are sleeping). That has been wonderful! 1. Have you heard about the Little Free Library project? It’s a grassroots movement to put small tiny lending libraries in neighborhood everywhere. Individuals create the library boxes and put them in their yard (I’ve also seen one at a neighborhood school yard). It’s a lending library for everyone — you can take a book or leave a book any time! Neighbors just down the street installed a Little Free Library about two weeks ago. Our LFL has one shelf for adult books and one shelf for kids books. The kids love to visit and exchange books. 2. To help with the initial stocking of the Little Free Library, we donated a stack of books we selected at the thrift store (including some classic kids chapter books I picked out for the neighborhood kids to enjoy!). But this is the stack I picked out for us! I just couldn’t go browsing books without picking out some for us! A dollar a book is just too good to pass up when there are lots of classic chapter books to be had. 4. Watching big machinery is always entertaining. Here the boys are watching a tree stump being dug up across the street. 5. Big bouncy fun at the “Neighborhood Street Fest” at the church where the kids attended VBC this week. 6. As always there is lots of arts and crafts going on around here. Here Miss M and friend Miss L create a sort of tye-dye effect on old rags with tempera paint. They came with this themselves, with some inspiration from a craft book! 8. and 9. Our “very hungry caterpillar” grew to be very large…and made its chrysalis a little over a week ago. Now we are patiently waiting to meet (and then release) our butterfly. This is one of my favorite parts of summer. Metamorphosis is such a miracle to see and I am amazed by it every time! Hope you are having lots of summer fun too! Robots are a perennial favorite topic for both Mr. K and Mr. E. They often brainstorm and day dream about ways they could make a robot of their own, whether it be from Legos or random household objects. So it’s no surprise they both greatly enjoyed Boy + Bot and Robot Zombie Frankenstein! We found Boy + Bot by Ame Dykman via another Read-Aloud-Thursday post (though I can’t remember which one…sorry!). It’s a really cute story about a boy, his robot friend, and the well-meaning ways they try and take care of one another. It’s a simple book, but one that we have read numerous times since we brought it home from the library. It looks like this is Dykman’s first book, and I hope she writes more books about this loveable pair or other equally cute stories for kids. Robot Zombie Frankenstein! by Annette Simon was a random sitting-abandoned- on-the-floor library find. Seeing that no child claimed it, I threw it in our library bag. 😉 This is a clever picture book that builds from page to page. It’s also about friendship — but this time, it’s a friendship between two robots. These geometric robots “dress up” with extra geometric shapes, and the result is quite entertaining. It’s a bit hard to explain — you really have to see the illustrations to “get” what is going on. The creative permutations of geometric shapes in the illustrations are really what “make” this book. Do you have any favorite robot books? Read-Aloud Thursday @ Hope is the Word AND Blogging Through the Alphabet @ Ben and Me! I think I might be breaking some kind of unwritten rule of homeschool blogging by doing two posts in a row. I think 90% of the homeschool bloggers I read post one faithful post per day, scheduled in some organized manner to post at about the same time every day. Maybe someday I’ll be that organized at blogging. Meanwhile, I am trying to catch up on my Blogging Through the Alphabet posts! If I can finish this in the next few minutes I can still do the “Q” link up! As the third child in the family with a younger baby brother who needs lots of attention, Mr. K gets the short end of the stick when it comes to my attention at times. So he has been eating up this chance to give me an entire stack of books to read that HE picked out, to play with me when HE gets to pick what we do and to have a couple special surprises just for him — like a donut at the grocery store and a fun sticker activity book to work on together (to make up for the treats and little plastic junk his siblings are bringing home).